With labor costs and complexities rising in the face of omni-channel fulfillment, the combination of labor management and slotting systems are helping drive better efficiencies. In an article in Modern Material Handling, Roberto Michel, Editor at Large, confirms that combining labor management systems and slotting solutions can make warehouse labor more productive. LMS solutions manage against engineered labor standards and optimize workforce assignments, while slotting solutions optimize the placement of stock keeping units (SKUs) in forward pick and other storage areas, minimizing worker travel. Most providers agree that labor management and slotting are complementary, with LMS metrics helping to determine when and where slotting might be needed, and labor management functions helping to evaluate the labor costs of slotting recommendations. 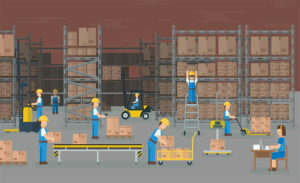 In the article, Andy Recard, TZA president, agreed that reducing labor costs is a primary impetus behind slotting initiatives, though balanced against other factors including building pallets the way customers want them, avoiding crushing items, and slotting products that are ordered together by their order affinity. “Once you’ve made your logical cuts around factors like stacking heavy items on the bottom, then you absolutely want to reduce travel time,” said Recard. Recard also sees that some organizations feed slotting software with LMS data because it contains precise information on how much travel is involved for pickers and current throughput with existing locations. Monitoring LMS metrics can also point out the need to reslot. For example, TZA’s ProTrack Labor Management Software generates a metric called “travel time per line picked” that can serve as a measure of slotting effectiveness. Of course, not every warehouse can justify a slotting solution. A beverage industry warehouse with 150 SKUs isn’t going to have nearly the same need for slotting optimization that a warehouse with 25,000-SKU serving multiple channels has. “Some companies may not have either the predictability of movement or the SKU proliferation that really warrants a heavy slotting tool,” said Recard.